My boyfriend and I have been together for 2 years, but lately we’ve been arguing a lot. Even on the phone we tend to argue about small, petty things. I feel like he takes a lot of anger out on me and I always seem to get my feelings hurt. I’ve tried to open up the communication lines but he has a tendency to build up a wall (as well as me) and we fight all over again. What should I do? You are experiencing the number one reason couples break up or fall into long-term dissatisfaction. The only solution is to learn new skills so that you can move through conflict and problems without it tearing you apart. Current research is showing the importance for all of us to learn new skills to better handle problems and upsets in relationship… so that we can truly resolve each issue rather than recycling it and building up negative feelings or resentments over time. Here’s a clinical research statistic for you to consider. Couples that stay together have just as many issues to resolve as couples who split up (i.e. disagreements, differences, conflicts, etc.). What is the difference? Couples who stay together and are happy have learned more skills in how to resolve their issues. Another important statistic is this. 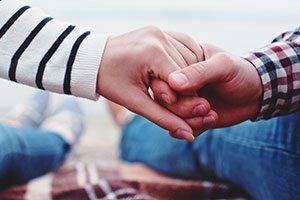 A large percentage of couples who split up, after the momentary relief of separation, end up regretting long-term that they may not have done everything they could have to save the relationship. Most of those with regrets recognize that they should have learned better skills for handling problems and conflict. My intention here is to alert you to the importance that by learning something new you may be able to change what you are experiencing now in your relationship. For certain, you will absolutely improve your future chances for success in an intimate relationship… whatever the outcome will be in your current relationship.